It was a Sunday evening in March, after a few glasses of wine, that Scott bought a ticket to Cartagena on a whim and quit his job the next day. What Scott initially thought would be the beginning of a long adventure throughout the continent actually ended up being a life- and career-changing moment. 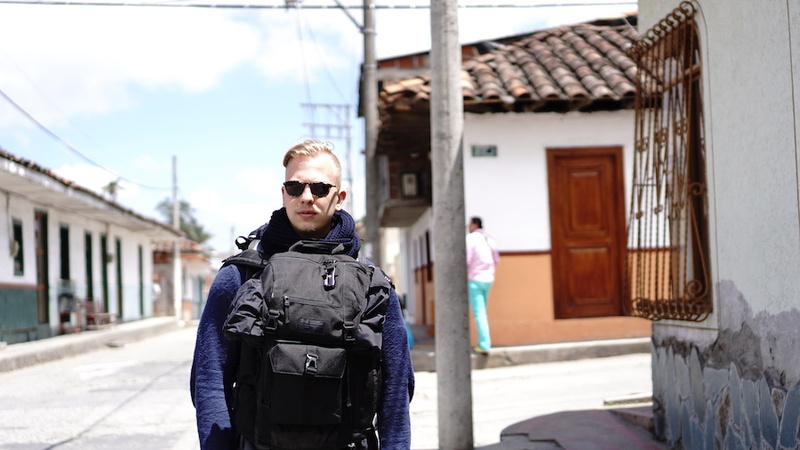 Be inspired by Scott’s entrepreneurial spirit and his take on being an expat in Colombia as I chat to him all about his experience. Be ware though, because this might just lead you to book your own ticket to Cartagena on a whim, too. If you’d like to read the rest of the expats in Colombia series, click here. I was born and raised just outside of Frankfurt, Germany in a small town called Langen and lived there until I was 16, when I left to play basketball in a US high school in North Carolina. After High School I decided to attend Indiana University to pursue a bachelors degree in finance. After graduating I worked as a stock trader and analyst for an investment bank in both NYC and San Francisco. However, I never found myself truly fulfilled by the work and knew that I wanted to do something where I had more control of my life and more autonomy. So, on a Sunday evening in March, after several glasses of wine, I booked a one-way ticket to Cartagena, CO and walked into my boss’ office the next day and quit my job. A few weeks later I was on my way to Colombia, where I wanted to start my travels through South America from. The goal for Colombia (initially) was to spend 1 -2 months there and then move on to Ecuador and gradually make my way through SA over the next 8-10 months during which I was hoping to have an epiphany as to what was next. Well, about one month into my time in Colombia I started meeting people in the coffee industry and before I knew it I decided to pursue starting my own coffee brand called Empatia Coffee. I would spend the next 5 months in Colombia between Medellin and Bogota meeting farmers, cafe owners, and distributors and learning a great deal about the world of coffee in Colombia. Currently I’m splitting my time between Chicago and Frankfurt to both spend time with my family and continue building the company (our roasting operations are located in the Chicago area). If Empatia succeeds as envisioned I will be spending several months a year on the ground in Medellin and all around the country visiting coffee farms. I had done very little research and have to credit one of my best friends who is Venezuelan for pushing me to start my journey in Cartagena. I had read and heard positive things but given the long history of violence in the country and my inability to speak Spanish at the time, my excitement was definitely clouded by some concerns and a high level of ambiguity around what I would find on the ground. There undoubtedly was a degree of nervousness once I was on that plane and knew I couldn’t go back. What I found was a country filled with people eager to put the past behind them and open the beauty of their country up for everyone to see. I had the chance to visit many places that were off the beaten track and engage with people outside of the major cities. Colombia in many ways has made giant leaps forward but many are still feeling the effects of decades of corruption and there are arguably still areas best avoided if you are not a local. Then again, this holds true for most countries/cities in the world. Nonetheless, the mindset I encountered in Colombia was one of optimism. Nearly all the people I met during my time in Colombia were extremely nice, genuine, joyful, and had a deep love for their country… and its soccer team! You have a company called Empatia Coffee. What is it all about and what inspired you to create it? I started Empatia after getting involved in the coffee world in Colombia and meeting a lot of people simply out of curiosity. I eventually had a binary choice in front of me: Pursue the opportunity at hand (start a coffee company) or move on and continue travelling and simply leave Colombia with fond memories and nothing more. After I jumped into it full-time while living in Bogota at the time, I started learning more from farmers and non-profit organizations about the horrendous financial reality most coffee growers face in Colombia and elsewhere around the world. After many weeks of phone conversations, discussions, and research the biggest question remained: How does one get coffee growers, who are so often exploited in the supply chain, closer to the retail profits and make growing coffee a viable long-term profession that can support a family. That’s where our 15% profit sharing initiative was born and when you crunch the numbers, that can make the difference for a farmer between running a business that’s losing money and going into debt or a profitable business that can properly provide for his family and employees (often family members make up the majority of the employees on farms). What should people know about Colombian Coffee? What makes it special? Colombia is currently the 3rd largest producer of coffee in the world right after Vietnam (No.2) and Brazil (No.1) and more than 10% of the Colombia’s workforce is employed by the coffee industry (That’s more than 2 million people). It’s often a little tricky in the coffee world because quantity is commonly discussed in units of 60kg bags or “cargas” (125kg bags). Using the former, Colombia produced roughly 11.5 million bags in 2015. If you do the math, that comes out to right around 1.5 billion (yes, billion!) pounds of coffee. Colombian coffee is special in that its rainy, high altitude mountainous range lends itself to the production of very high quality arabica beans and due the bio-diverse terrain, you can come across all different types of arabica plant varieties being grown. Put all that together and you get a complex range of taste profiles among Colombias coffees that have given the country the repututation for having some of the best coffee in the world. Unlike many other countries, Colombia produces only Arabica beans, which are milder in taste and generally considered higher quality. Colombian farms tend to be rather small, with most farms not surpassing more than 5 acres and family members make up a large part of the workforce. The high level of family involvement creates a lot of pride but it can also affect family members’ abilities to pursue an education or other professions, since most farms depend on these members for their financial and operational survival. Many farmers don’t have the luxury to simply hire more workers and offer flexibility to their families. I’m a huge fan of Ajiaco (Colombian Chicken & Potato soup). There’s a little place in Medellin near Parque Poblado that boasts a mere 3 items on its menu. One of them is an Ajiaco that is just spectacular. I think the answer to that question is somewhat dependent on where in Colombia you live. Every city has its own challenges associated with it, as well as its positive attributes. However, the most general challenge I faced was acclimating to the cultural differences, especially when it came to business matters. While most people are extremely nice, the level of responsiveness or pace at which work is being performed can sometimes be significantly slower than what we are used to in the USA or Germany for example. Most ex-pats I’ve met who are doing business in Colombia have had similar experiences. This can be frustrating when it happens but you learn to accept it and work with it. There’s an arepa restaurant in Santa Marta (I forgot the name, unfortunately) that serves up some of the most delicious arepas I’ve come across. The one that sticks out the most had a guacamole base, sliced filet meat, and just the right amount of cheese melted on the filet. I’m a huge fan of Salento. In part because its in the Quindio, one of the top coffee producing regions so you have access to a lot of farms, but more so because things just slow down when you spend time there. Whether you are staying at a hostel or on one of the fincas in the area, you wake up to total silence (ok, maybe a rooster somewhere in the distance can be heard ), walk on the porch and just have mountains around you covered in morning mist. Several times a week you see faint lightning at dusk from thunderstorms far away that make for an incredible visual spectacle. There are no taxis. Only jeeps, where often you are forced to stand on the back with only your firm grip and a good stance keeping you safely on board. Lastly, there is a surprisingly eclectic variety of quality cuisine available in town. Aside from great traditional Colombian restaurants, you can head over to ‘Brunch’, run by an American expat, who makes his own peanut butter and jelly in-house and who’s breakfast & burgers can hold their own with some of the best breakfast places in the USA. It is truly an oasis for backpackers who have been on the road for a while and want a taste of home. Do you have any tips or advice for people wanting to follow their travel dreams to Colombia? And perhaps even start a business in Colombia? My advice: Just go! Don’t spend too much time planning but rather dive in and see where it takes you. You can figure out everything you need once there and while that may seem scary to some people, your travels will feel multiple times more adventurous and magical when you don’t always know what is next, especially in a country that has so much diversity in its terrain and nature. Also, get out of the big cities and see the countryside. Even if you’re not backpacking and want a more luxurious experience, go find a nice estate to stay on for a night or two (airbnb is widely used so look on there for such offerings). If you are in Colombia and want to start a business, there is a good chance somewhere in your area a foreigner already started one. Local laws and regulations vary so its pertinent that you inform yourself properly and follow all the rules. Things are a bit less structured than in the US and that goes for how you are treated when in violation, as well. Therefore, make sure you are compliant with everything and seek to over-communicate so there are no surprises. If your’e a digital nomad and work from your computer, then Medellin is your city. Coffee shops are filled with travelers discussing their startup ideas, outlining their next blog posts, or coding away on their laptops… coffee always in hand, of course. Our website (www.empatiacoffee.com) offers more information on who we are and what the problems in Colombia consist of. As viewers will learn from our page, we are doing a crowdfunding campaign on www.indiegogo.com in the spring to finance the last part of our startup costs. We want to make sure we can reach people when we kick it off, as we will be offering some really exciting adventures like a multiple day trip with the Empatia team to Colombia to visit various coffee farms, meet the farmers, and learn first hand what it takes to grow great coffee. Most of these experiences will have limited seats, so readers should definitely submit their email to our mailing list on the website so we can inform them as soon as we start the campaign. In addition, we can be found on both Instagram and Facebook. Or people can get in touch directly at info@empatiacoffee.com. Are you an expat in Colombia, or know of someone who is? Let us know all about your experiences by emailing info@sarepa.com.